In a recent announcement the company seems to be entering the SEM (search engine marketing) business and are offering services to users willing to advertise on Google AdWords through AdSense. An interesting questions popped up into my mind, does that involve any strategic agreement with Google for reselling their AdWords packages across the country in the brick and mortar stores of Sam’s Club. Does Google have initiated that strategy or it is an idea of Sam’s Club management to offer more services to their more than 47 million members nationwide. Is AdWords becoming a product that you can find in your local stores, groceries and the mall next to you? Does that move affect the most recent Sequoia funding for the SEM Firm Kenshoo? Or it legitimates the market and makes the SEM services wider known and popular. Here one can question the Internet experience of an old brick and mortar business like Sam’s Club but no one should underestimate the huge distribution channel Sam’s Club represents for … Google. Nonetheless, retailing SEM services is something new on the market and under no doubt the Sam’s Club’s target users are quite different from the target clients Kenshoo and Fathom Online are running after, which leaves space for all companies involved. The best guess is that with AdSense program, WalMart wants to help newbie wares sellers on the internet with their online advertising needs. Your Sam’s branded advertisement can be yours for as low as $100 a month. On the other hand $100 for SEM services on Google is an amount not enough to build and run a decent marketing campaign. Sam’s Club is a membership-only warehouse club owned and operated by Wal-Mart Stores, Inc. Becoming a Member at Sam’s Club can either be done online or at your nearest Sam’s Club location. Advantage Membership, which offers two Membership cards for you and a household member. Business Membership, which is available at a slightly lower cost and provides a company Membership card plus two personal Membership cards. PLUS Membership (either Advantage PLUS or Business PLUS), which provides extra benefits above and beyond either of the other Membership types. You can also shop online at any time for home delivery or Click ‘n’ Pull(r). Sam’s Club Memberships provide the opportunity to save on a complete line of products such as quality jewelry, designer goods, sunglasses, crystal and collectibles, high end electronics, floral, apparel, organic foods and choice meats. In addition to affordable luxuries and exciting treasure hunt items, Members also enjoy services including — healthcare, business, financial and personal. Examples include health insurance, web site development and maintenance, cost effective merchant credit card processing services and auto, boat & RV and travel programs. A typical Sam’s Club stands between 110,000 and 130,000 square feet. Most locations feature Pharmacy, Tire and Battery, Photo, Bakery, Optical, Café and Floral departments. The Sam’s Club division of Wal-Mart Stores, Inc. had total sales revenue of US$37.1 billion for fiscal year ending 31 January 2005. Sam’s primary competitor is Costco Wholesale. The first Sam’s Club opened in April 1983 in Midwest City, Oklahoma in the United States. Sam’s Club is named after Sam Walton. To purchase items from Sam’s Club, one must purchase a membership. Many Sam’s Club customers are small businesses that wish to offer customers a limited selection of food without the expense of having it delivered. In 1993, Wal-Mart acquired PACE Membership Warehouse and converted many (but not all) PACE locations into Sam’s Clubs. Even though membership is required to purchase at Sam’s Club, a one time day pass may be obtained from many Wal-Mart newspaper ads. A 10% surcharge is added to the prices for non-members. No membership (with no surcharge) is required for Optical, Pharmacy, or Cafe (as available per club), or to purchase alcohol. However the surcharge can be applied to a membership (which is currently $35 for Business members, $40 for Advantage members, and $100 for the Plus membership). All memberships are 100% refundable at any time for any reason, even on the date that it is to be renewed. Renewal of memberships can be done via online, through the mail, in-club at the Membership Services desk, any cash register, and also at the new ATM/Membership kiosks. The latest flagship store opening as of September 13, 2007 was in Fayetteville, Arkansas. It is the second largest Sam’s Club store; its largest is located in Utica, Michigan, with over 145,000 sq. ft. of retail space. Sam’s Club ranks second in sales volume among warehouse clubs behind Costco Wholesale, despite the fact that Sam’s has more retail locations. After Costco’s announcement on its change of return policy for consumer electronics (now within 90 days) beginning on February 26, 2007, Sam’s Club finds itself now to be tied with Nordstrom for having best, most liberal return/refund policy in the retail business. In 2006, Wal-Mart acquired The Central American Retail Holding Company (CARHO), which operates ClubCo stores, similar in concept to Sam’s Club, although with a smaller footprint. In September 24, 2006, Sam’s Club received a new logo. The new logo has a nice font and features a green and blue diamond inside the big blue diamond, found above the word ‘Sam’s’. Sam’s Club’s previous slogan was “We Are In Business For Small Business” until 2006, Sam’s Club now has no slogan after the redesign of the new logo. The decision to remove the slogan comes as Sam’s Club attempts to remove itself from serving just small businesses and open up to more individual customers. It is possible that the new slogan is “Enjoy the Possibilities” but it’s probably used for Christmas. There has been much recent talk about a possible sale or spin-off of Sam’s Club from parent company Wal-Mart. If this were to happen, Sam’s Club would either be owned by another company, or be an independent standalone retailer. Two recent Motley Fool articles explore the implications for both divisions. 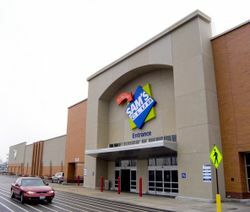 At Wal-Mart’s 2007 annual shareholder’s meeting, management said that Sam’s Club is not for sale, although they didn’t say they are not considering a spin-off. In related news Wal-Mart shut its movie download service on December 21st. The video service was launched this February with all the major film studios providing content. Taking that web failure into consideration it is no wonder Walmart is now trying to stick with a proven leader on the Internet — Google.